Sharing my passion in food through recipes and dining experiences. I have a thing for beef noodles soup. I think it’s great that every culture (and in Malaysia’s case, almost every region) have their own take on a beef soup recipe. Needless to say, I have a soft spot for a really good bowl of pho, but since we live in a country with so much to offer, I thought it’s only fair to give other types of beef noodles a go. 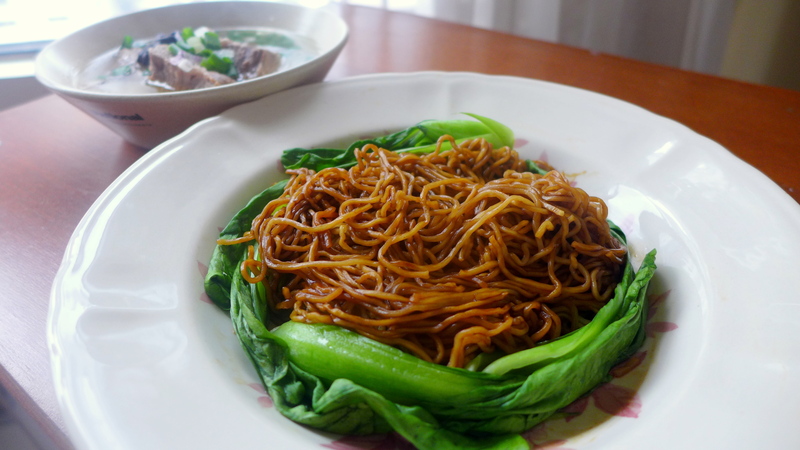 So when Wendy put up her post for her copycat version of Onn Kee Beef Brisket Noodles in Kampar (head over to her blog to read all about Onn Kee’s beef noodles), I knew I had to try it. What was intriguing, too, was her method of express char siew oil (read on to find out). And for something so tasty and comforting, it really didn’t take much of an effort to make. This time, I have gone for a totally different and time saving method and used my Philips Pressure Cooker for the soup. The original recipe calls for 4 hours of cooking time, which I wouldn’t have, but with my semi-new gagdet, I wanted to know if I can produce a similar results. So with just 45 minutes for the initial boil, then add seasoning and cook (with pressure) for further 15 minutes, the result was a piping bowl of soup, spicy, aromatic, with tender bits of beef and the daikon still keeping their shape. Fabulous! Fish out the brisket chunks, slice them and put it back into the pot. 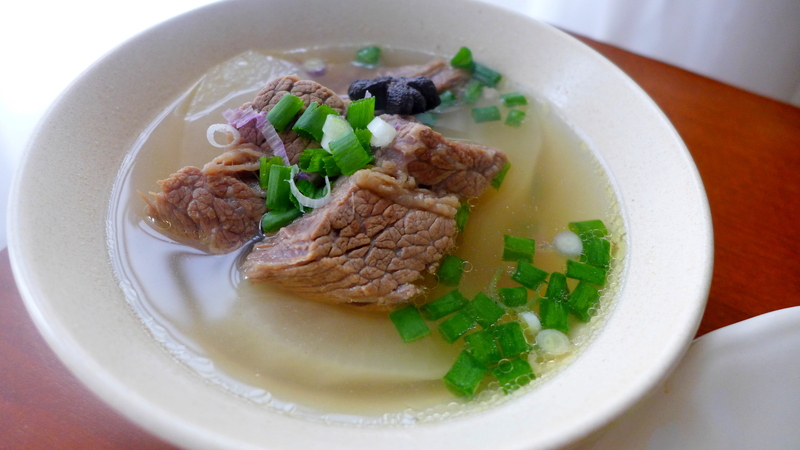 Serve the beef brisket soup with a sprinkling of spring onions. Mmmm, do not underestimate the healing power of this soup. Slice the fat pork belly thinly. Put in into the wok with 1 Tbsp of oil and slowly fry until it is very slightly golden. Add in sugar and light soy sauce and cook the belly until it turns dry and dark. Discard the belly bits and retain the renderings. 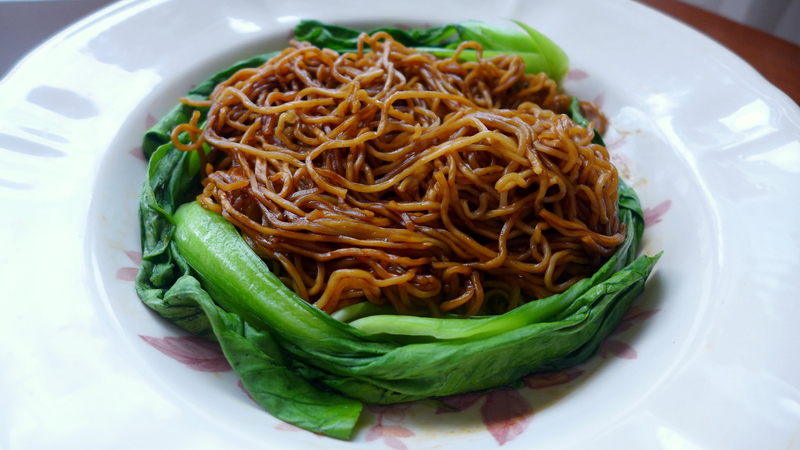 Loosen single portion fresh egg noodles/fresh wantan noodles. Put the noodles in a noodle strainer. Cook in boiling water for 15 seconds. Rinse it under running tap water. Blanch it again for another 15-30 seconds depending on the thickness of noodles. Put noodles in a plate. Top with 1 Tbsp of renderings, some dark caramel sauce (or dark soy sauce), light soy sauce according to taste. Toss the noodles. Garnish with some blanched baby bok choy or mustard green. Of course, you will probably be content with just regular pork lard for the noodles. For our muslim friends, a mix of shallot or sesame oil could suffice. But the char siew oil really gives it a little more ooomph. Kampar Beef Brisket Noodles, done! This is a recipe I am going to keep for whenever I have my beef soup craving. Just add a few more spices, onions, ginger and it’ becomes a beef pho soup! By the way, as for any great soup, the flavours get better if you let it sit for longer (overnight is best). The great thing about cooking for one is that I get to enjoy this multiple times, hehe. I also gave a portion of the soup to Miss Poesy as she also has the same affection towards beef noodles. Thank you, Wendy, for this excellent recipe! I will need to hunt down some tendon and beef tripe for next time. 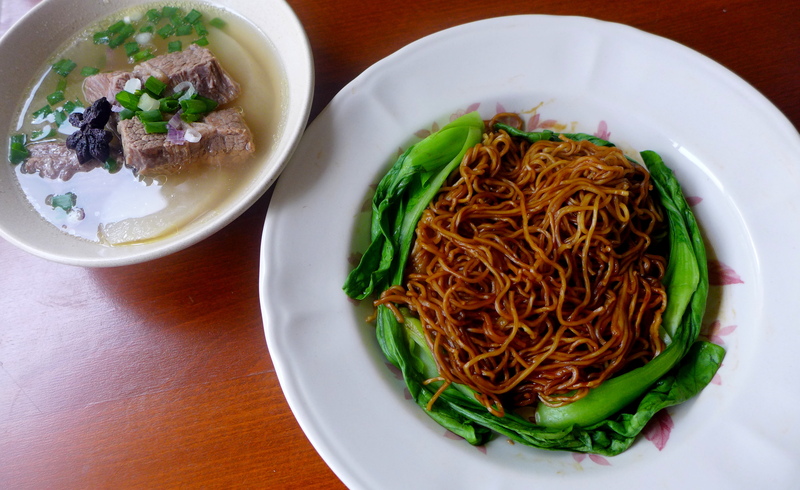 What’s your favourite type of Beef noodles? Yeah the original recipe calls for 4 hours but with the pressure cooker the beef became tender in no time at all! Never thought I would love it so much! Much thanks to Philips! 😀 Waiting for a chance to redo the tonkastu broth with it. Looks good. Been wanting to buy a pressure cooker for a while now – yet to get down to it. Old man, long life… LOL!!! Hi Kelly! I love the braised version but this looks yummy too! Mmmm braised version would be much richer in taste. I wasn’t expecting to see cinnamon and tangerine in the ingredients. I bet they add a nice layer to the flavours though. Cinnamon is used in a lot of Beef dishes, the Pho soup also has Cinnamon stick (although sometimes Cassia bark is used instead). I’m a girl with a big dream, who has taken a sabbatical from Medical career for a seachange and now concentrating on pursuing a Music career. This is specifically where I share my experiences in the kitchen, and out dining.